Everybody’s heard the advice before: “Buy the dips!” What if you don’t have the time to sit around and chart all day? What if your TA is a bit off and it buys before the dip is over? Both are valid concerns and are somewhat mitigated by the Flash Crash Bot. This bot is intended to have a “Base Price.” This name is a bit confusing because it’s not necessarily anywhere near current or prior market values it’s just what you’d like to use to base your configuration on. The Price Settings are pretty simple; set the price you’d like to base the rest of the configuration on, pick a spread type, and then set the spread. Starting out it’s probably easiest to use a fixed percentage and then set the spread to something that’s at least twice your fee cost plus a little bit for profit. This bot’s also named a bit confusingly. Its name sort of implies that it’s only useful for handling crashes but the opposite is also true. You can use this bot to sell coins you’re holding and take advantage of price spikes to make some gains. You can set the amount you’d like to buy or sell in the amount settings section. 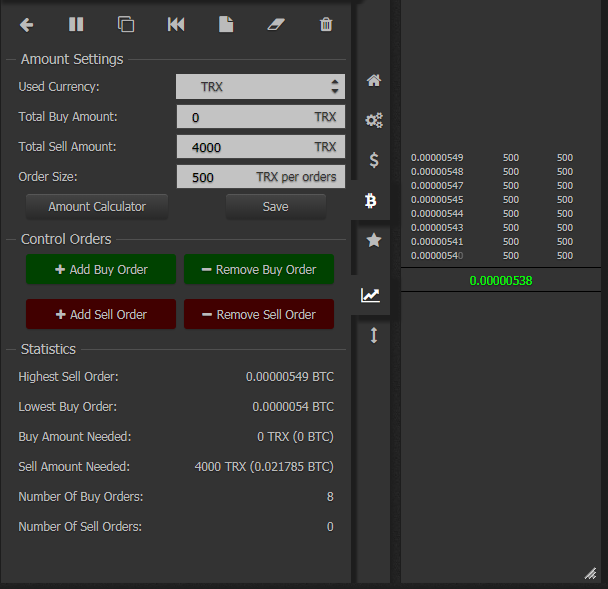 The Order Size setting shows how many coins will be used for each order regardless of buy or sell. The Refill delay setting allows you to add some padding time after an order is filled before another order is added to replace it. You’ll notice that you can have buy and sell amounts here and this bot can trade reasonably quickly so you can use it as a scalper bot. The only downside here is that if the market trends down quickly the bot can be stuck holding a bag. The basic settings aren’t really that powerful by themselves but the advanced settings are where this bot really shines. What’s that? You don’t see a section for advanced settings? Click the Full Screen button and you’ll be taken to a whole new world. On the Amount Spread Settings tab you’ll see your buy/sell/order size settings and to the right you’ll see the order book for your bot. It’ll look a little different if it’s not actually running. The red/green buttons will remove/add orders from the ends of the list (top for sell, bottom for buy) one per click. These modifications take place immediately without prompting and do not need to be saved so be careful. This is where the magic happens; Follow The Trend is the most powerful thing about this bot in my opinion. It allows the bot to monitor the market and make changes to its orders based on the movement of the market as long as they don’t occur within the specified time period. Confusing? Maybe a bit. The most important thing to remember about this setting is that it’s temporary. As soon as an order is filled, this will turn itself off and it won’t be active again until you set it again. The second most thing to remember about this setting is that it only works if you have only sell or only buy orders. It won’t work with a spread across the base price. Assume for the following discussion that I’m wanting to buy when the price dips. In my example configuration the bot is setting orders at .25% intervals; that’s the step. The price channel is a bit of wiggle room the bot gives the market to trade in. This will change based on the volume and volatility of whatever pair you’re trading. The channel size is a multiplier of the step so in my case if I set the channel size to 2 steps it would push my orders back from the current market by 0% Wait, what? The Base Price setting is where you want your buys to happen so the rest of the bot configurations are assuming that value is at the low end of the current trading range. When you modify this setting you’ll see the channel appear on the chart alongside your orders. With Follow the Trend on the bot’s going to be chasing the market price and it’ll only be offset from the market price by one step; the same as if you didn’t have Follow The Trend off so why is this useful? It’s mostly useful if you’re using the bot to wait for price spikes to sell coins but if the market is moving slowly and rationally (recovery) then you can turn this on to make your buys fill with the bot slowly easing on up to the market price. However, if the market’s thrashing you could end up holding a bag with a quickness. How do you avoid that? 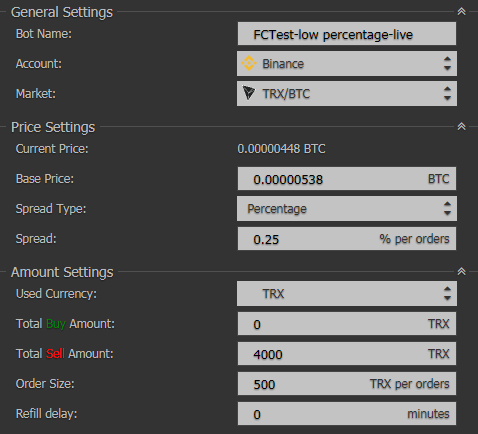 The next configuration option is Price Channel Offset; this puts a number of steps between the base price and your orders. In my example if I put 10 steps here it would keep my orders 2.5% away from the market as it was moving. If I left the Check Interval at 1 minute then every minute it would make sure that my orders were at least this far away from the base price and adjust if needed. If during the check interval the price moves enough to fill a buy it will immediately turn off Follow The Trend and wait for the order to fully fill. Once it fills it will immediately put a sell order on the other side of the base price offset by one step. Using my examples it’d be the base price plus .25%; mad gains. Why would you want to do this? You wouldn’t. Hopefully you’d have a reasonable non-scalping percentage configured for your step. Normally when markets do this whipsaw motion and they crash within a short time period they usually snap back near to where they were relatively quickly which means quick, easy gains. Buy the dips! Let’s say you were using 1% steps on your orders and had your channel offset set to 3%. Your first buy order would be 4% below market and if it filled, it would turn off Follow the Trend, and put a sell order 1% above the current, lower market price. This means the price moved at least 4% down in under a minute for this to trigger and usually the price snaps back to just below where it was previously so you’ll make a quick profit without having to think about it. If the price continues to dip it’ll hopefully buy into your other orders and will set sell orders appropriately. “But what if it continues to drop?” you ask. I hear you. You can either hold the bag or you can configure the bot to turn itself off if the price goes outside a certain percentage range of your base price. 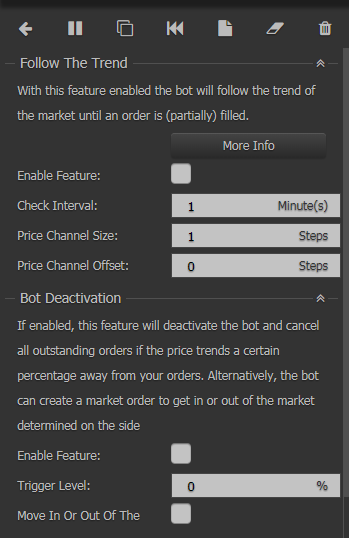 You set a Trigger Level of a percentage from the goal you’d like the bot to turn itself off at and then you can choose whether or not you want the bot to set a market order to get out of any positions it may be in by selecting the “Move in or Out” checkbox. Depending on which side of the market (buy/sell) your orders are in it’ll place the opposite order. This can be automated FOMO or Panic Selling so use this configuration wisely! The last option is Refill Delay and this works exactly as it does on the basic configuration screen. Learn the market you’re trading and set it appropriately. I am not associated with Haasonline. The opinions and analyses contained within this page are my own and should not be taken as advice expressed or implied. Trading involves risk including total loss of investment; make sure you only risk what you are able to lose.